This post is part of our special coverage Egypt Revolution 2011. Pope Shenouda III celebrated Monday the 40th anniversary of his ordination as Pope of the Coptic Orthodox Church in Egypt. The 40th anniversary coincided with the end of the 40 day mourning period after the Maspero massacre, where 27 Egyptians, mostly Coptic Christians, were killed. In the Egyptian tradition, the 40th day after death is normally a mourning day, so many Coptic Egyptians did not expect Pope Shenouda to celebrate his ordination anniversary this year. Pope Shenouda III, Pope of Alexandria and Patriarch of Saint Mark Episcopate. Image by Mahmoud Khaled, copyright Demotix (14/09/11). جاء هذا الاحتفال متزامنا مع الذكري الاربعين ايضا و لكن لاستشهاد شهداء ماسبيو.. و هيهات ما بين هذا “الاربعين” و ذلك! استشهد قبل حوالي 40 يوما 27 شهيدا في يوم دامي مورست فيه ابشع انواع العنف ضد متظاهرين سلميين خرجو تنديدا بحرق كنيسة. في الوقت الذي ثار الثوار احتجاجا علي مذبحة ماسبيرو و ادانوا المجلس العسكري بشكل واضح و صريح، استقبل البابا شنودة و المجلس المقدس المدبر و القاتل و المحرض بالابتسامات و الترحيب في صفقة اعتادنا عليها بين السلطة و السلطة، السياسية و الدينية. The celebration coincided with another 40th commemoration, but this time it's the end of the 40 days period after the death of the Maspero martyrs. And there is a huge difference between this 40th commemoration and that. About 40 days ago, 27 martyrs died in a bloody day when one of the most brutal acts was committed on peaceful demonstrators, who went out to condemn the burning of a church, which happened earlier. 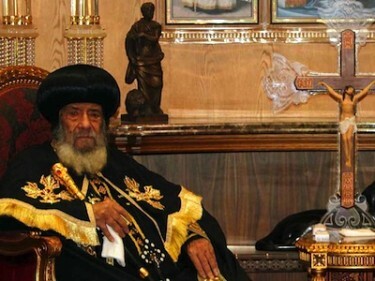 At the same time the revolutionaries demonstrated to clearly and directly condemn the Maspero massacre and SCAF (Supreme Council of Armed Forces), Pope Shenouda and the Holy Synod met with those who planned, instigated and committed the massacre with a welcoming smile, in a deal we are used to see between the two authorities - the political and the religious authorities. Alaa defended the Christian protesters against the violence and the crimes of the military and stood in solidarity with them with his body and soul, while the Holy Synod had friendly meetings with the murderers. Diana started by criticizing how religious figures in Egypt want people to follow them blindly. The Egyptian law makes it harder for Christians to build new churches, and that's why some people called for a unified law for building places of worship for all religions. But according to RunGeo, Pope Shenouda had a different opinion. Mina Zekri added that sectarianism and hatred for other religions and sects in Pope Shenouda's era reached an unprecedented level. He then continued to explain to Rehab Bassam (@hadouta) what he means. @minazekri: @hadouta I studied in Sunday schools and in preparatory schools not to make friends with Muslims, and [my teachers] cited evidence from the holy book. Nany Atef shared the same opinion with Mina about Sunday Schools [ar]. When it comes to the Pope's political role and relation with the regime, Hany George wrote that the Pope was against the Maspero protest. Wael El-Moghany described Pope Shenoda's era as 40 years of deals with the regime and Mina Samir criticized the Pope's preference for the Copts to be protected by the regime's politics and police instead of them being protected by the love of the people around them. @minazekri: In 2009, His Holiness announced his support to Gamal Mubarak in the presidential elections and said he is the best successor to his father even though he wasn't even running for president yet. Zekri then noticed that almost all those who are participating in the hashtag are Christians, so he called on Muslims to participate too [Ar]. So Mahmoud Kassem compared the Coptic Church's ideology to that of the Salafists. Finally, Dalia Ezzat called it “an amazing courage by some Egyptian Copts criticizing their religious leadership”, while Sotsoy - like many other users - found it “distasteful”. Peter Gamil said he is against ordination celebrations now, but he is also against the way people criticized the Pope in the hashtag. He also added that they Pope did not forget the Martyrs of Maspero, however in the Christian traditions they should be happy for the martyrs and celebrate their martyrdom instead of mourning it. Beshoy Naeem called it “social hypocrisy” and Fadi Mckean sees it as a way for some Christians to prove how secular they are. @fadimck: This hashtag is a simple example of some Christians who act as if they are secular and to prove that they are cursing the Pope. Stop acting.